Victorian-era heroes always have a use for gear, guns, and garb .*.*. and that goes doubly so when it's a steampunk world! 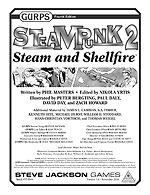 Phil Masters &ndash; author of GURPS Steampunk 1: Settings and Style and GURPS Vehicles: Steampunk Conveyances &ndash; returns with more insight into alternate late 18th- through early 20th-century technology, with GURPS Steampunk 2: Steam and Shellfire. This supplement is jam-packed with real-world gear, unlikely gizmos, and impossible oddities, all with an eye toward making the world come alive and preparing your explorers for adventure. It looks at historical and implausible developments, such as clockwork automatons, gargantuan gear-powered computers, and strange chemical cocktails. It also features weapons and protection &ndash; including steam-powered armor and guns that never were &ndash; and provides new options for garb and what you can hide there. Warehouse 23 News: Everything Munchkin Starfinder! Get everything in the Munchkin Starfinder universe! With the Munchkin Starfinder I Want It All! * box, you'll find every physical product unlocked and released during the Kickstarter campaign, including items that will not be available anywhere else! To prove you've got it all, you'll get a certificate with spots for signatures from Steve Jackson, Howard Tayler, and Andrew Hackard. Plus, the box comes with its own Munchkin Starfinder rule! Order now on Warehouse 23!